depended upon our attention to to tiniest detail." Who amongst us will ever forget that magic moment when man first touched down on the surface of our moon and walked his first step on it. One man who will never forget is Mr. Lou Russo, Founder and Chairman Emeritus of Comprehensive Consulting Group. As Spacecraft Director at Grumman Aircraft, he developed the programs and led a team of over 300 people to help create the lunar module “Eagle” which touched down on the moon’s surface at 4:17 p.m. on July 20, 1969 and lifted off to complete its historic flight 10 hours later. In 1971, Mr. Russo took his own small step to found CCG. 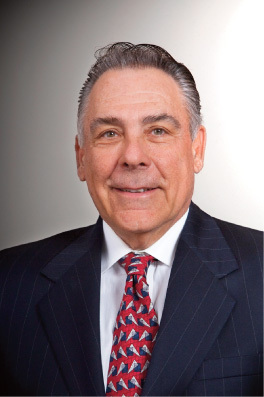 In this profile, Mr. Russo was interviewed to find out more about his extraordinary life and how he applied the principles of leadership, teamwork and disciplined attention to detail—developed and practiced during his “spacecraft years”—to the management of his financial consulting organization. Q. WHAT ARE SOME of the most important characteristics you observed while leading the Eagle design team? A. That paying attention to details, being prepared to sweat the small stuff, was often the difference between success and failure. Also, that defining the negative possibilities and overcoming them was one of the keys to finding the correct solution to the problem. I found that the key skill was the ability to define an objective and then to work analytically as a team to assemble and review all of the possibilities available that would help in the achievement of that objective. In the case of the Eagle, it was easy to define the objective, but very difficult to achieve it. It involved total focus on the details and an extremely conservative yet innovative approach. The lives of men and the dreams of our nation depended upon our attention to the finest detail. Q. THE BBC CALLED the moon landing “the greatest human achievement ever” and over one-fifth of the earth’s population watched the momentous event on television. How did you feel at that moment? A. It was unbelievable. It was a moment in time that will be locked in the forefront of my mind forever. To me, it was the ultimate example of what can be accomplished when there is a strong vision, leadership, planning, teamwork and a willingness to confront a seemingly infinite amount of detail. Q. WHERE IS THE parallel between the Eagle project and your consulting group? A. When people have spent a lifetime building a business and other assets, their lives and dreams depend upon the preservation of those assets. I’ve done everything possible to bring the spirit of the Eagle project to my group. We have a vision. We have leadership. We are a team that plans and sweats the details for our clients. We approach every client relationship on a long-term basis. We see each action taken for a client as another step towards the achievement of an overall plan. Over the last 39 years, more that 1,000 companies have entrusted their assets, and the assets of their employees, to my company’s care. We’re very focused on building complete technical financial skills in our consultants, actuaries, attorneys and administrators and bringing the power of a team of these trained minds to bear on each of our clients’ financial needs. Our focus is on integrity, stability and conservatism. Q. AFTER SPACE EXPLORATION, why benefits consulting? A. As an engineer operating at that level, there was tremendous emphasis on analytical and mathematical skills. After the exuberance of the Eagle, I needed something new to challenge me. I realized that business owners had a severe problem trying to keep abreast of the information necessary to take care of many of the day-to-day financial aspects of their companies, such as pension plans, taxes, benefits, investments, etc.—and that my skills could be applied to helping in these areas. Q. HOW DID YOU go about becoming qualified in this area? After years of intensive study, I added a Masters Degree in the Science of Financial Services to my Masters Degree in the Science of Electrical Engineering. At the same time, I was building a team of professional consultants who could help business owners solve their problems, without risk to their livelihoods. Our team and our growing client list soon focused us in on the problems facing business owners and we began to sweat the details and create the plans necessary to help our clients. Q. HOW DOES COMPREHENSIVE Consulting Group work? A. The group consists of three parts. The first is CCG Benefits which focuses primarily on health care, plan design, plan implementation and cost containment—and creating significant cost saving to companies. Next is CCG Pensions which focuses primarily on employee benefits plans, plan design, administration and actuarial services. And, finally, CCG Investments which focuses primarily on maximizing portfolio performance, while minimizing portfolio risk. I’ve already used the word “independent” in this interview. We believe that this is one of the keys to the way in which we so successfully serve our clients’ needs. Our consultants believe that they have fiduciary responsibility to their clients. Their clients’ needs and objectives become our needs and objectives. We have a large group of highly qualified in-house experts who work with the consultant to create a solution for any financial need that a client may have. Because our staff are salaried, they’re not biased toward any particular products or solutions to earn commissions, but are completely focused on providing the correct solution to their clients’ problems. In the reception area of our office complex, we have two binders filled with letters from satisfied customers. I’m very proud of these binders. They tell us that each step forward we’re taking for our clients is a step in the right direction. This experience has formed the basis of CCG seeking to control both the consulting (plan design) phase and the ongoing administration phase as one cannot be successful without the other. There is no accountability without both being under the direct control of the consultant and the client. A rocket would launch the spacecraft to the moon. The spacecraft would fly to the moon and orbit it. A smaller portion of the spacecraft would land on the moon and return to lunar orbit. Then a portion of the spacecraft would return to earth. Maximize benefits. Minimize costs. Increase flexibility and control. Maintain full accountability for plan performance. Lou Russo’s experience with the Apollo Mission lies at the root of CCG’s belief that with sufficient planning, any objective is achievable. This simple, but effective, 6-step planning process ensures that all of your plan details are attended to, now and in the future.